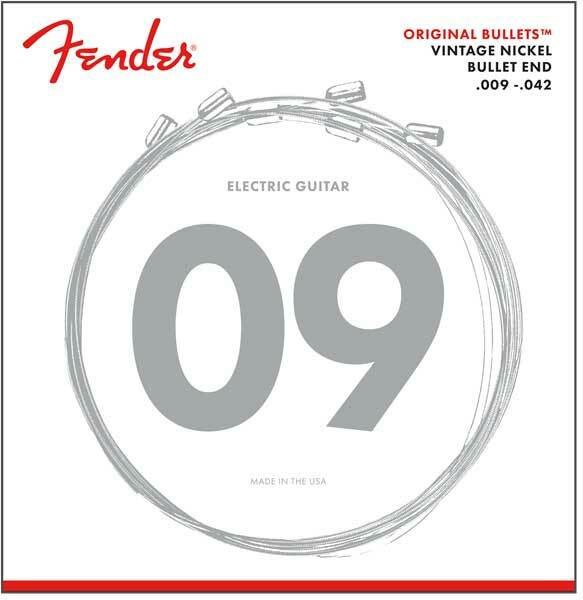 Fender®Original BulletsPure Nickel wound strings with bullet ends deliver a smooth feel with reduced finger noise. The tone is rich and warm, with abundant harmonics. The patented bullet-end creates a sonic coupling between the string and bridge block, for rock solid tuning stability and increased sustain. Great for Blues, Jazz, and Classic Rock. The German-made bullet end fits precisely into Fender® tremolo blocks, enhancing sustain and stability. They stay in tune better and they resonate more than standard ball-end strings. By the way, the bullet end isn't just for trem users; it also enhances sustain and stability on guitars with string-through-body type bridge designs. Fender started with Pure Nickel wound strings (Original 150s) and added their newly improved patented Bullet end. Designed especiallly for your tremolo-equipped electric guitar, the Bullet end lends additional tuning stability to the warm full vintage sound of Pure Nickel.